The Lost Dutchman Kennel Club, Inc. is an all-breed kennel club serving the greater Apache Junction, Arizona area. The Club is licensed by the American Kennel Club, and is dedicated to the support and enhancement of the sport of purebred dogs, both in conformation and obedience. . . . . serious about responsibility! 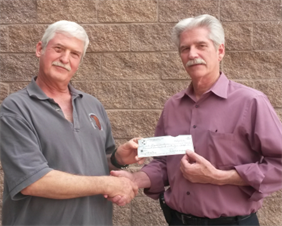 The Lost Dutchman Kennel Club has pledged $10,000 to the Apache Junction Police Department K9 Unit over the last few years. With funds donated by LDKC, the department has purchased a new bite suit, bite suit sleeve, travel gear for the K9, and, most recently, a new K9 officer when the original dog retired. When first asked by LDKC what was needed to help out the canine unit, the human officer responded that they needed a new bite suit because they were afraid the one in use was so worn that the dog might break its teeth. That comment certainly sealed the deal for Club members. The Club has made a commitment to continue to provide financial support to AJPD's Canine Unit over the next several years as part of its giving-back to the community. Each year at the Club’s annual All-Breed event, the AJPD does a demonstration at the shows. LDKC supports responsible ownership AND responsible, preservation breeding of purebred dogs.